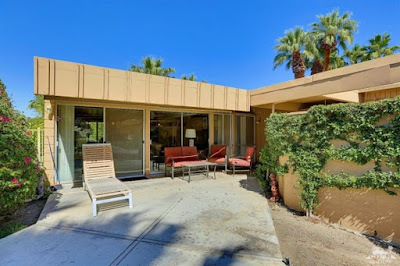 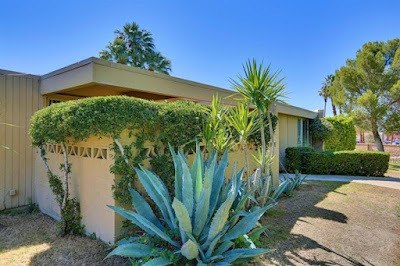 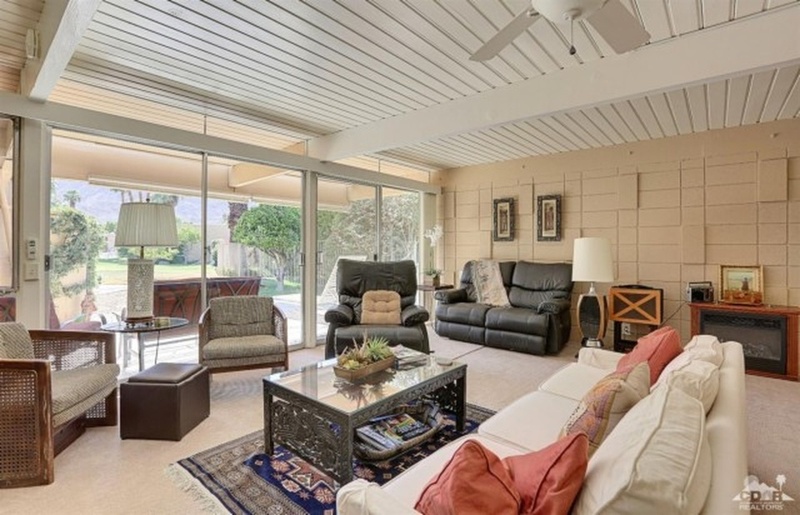 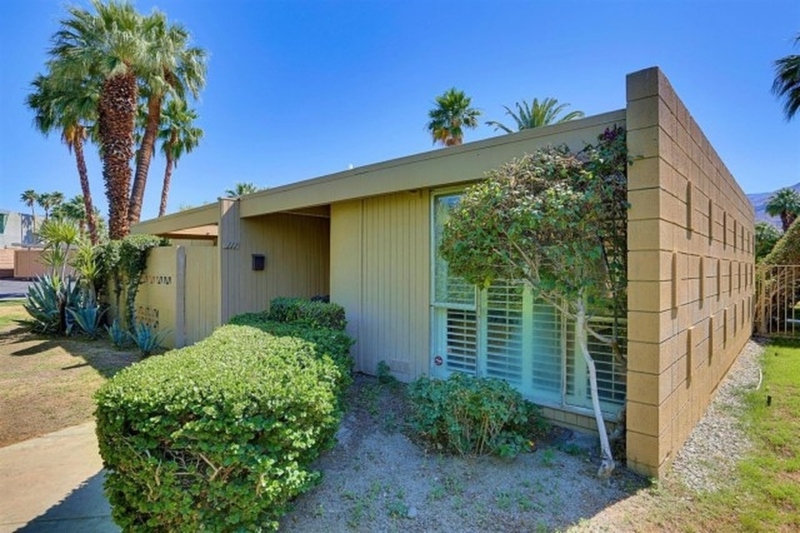 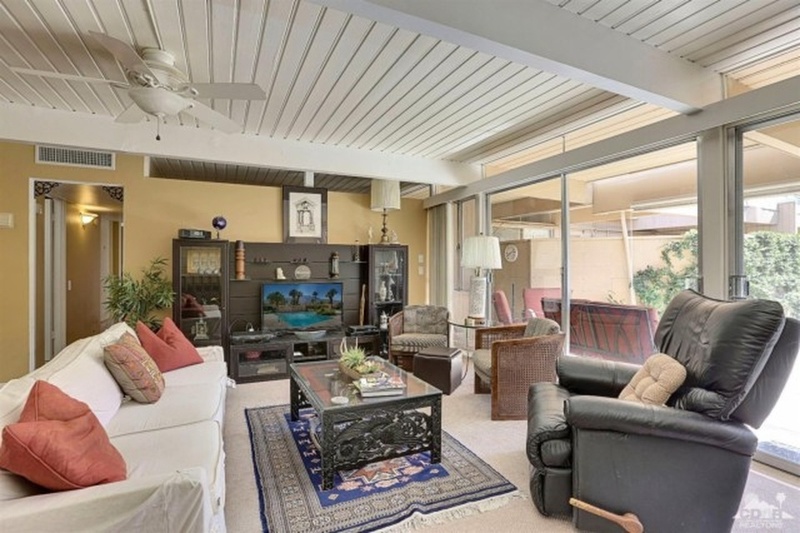 Built in 1960 is this early Sandpiper Palmer & Krisel-designed condominium in Palm Desert, CA that’s been on the market for approximately two months. 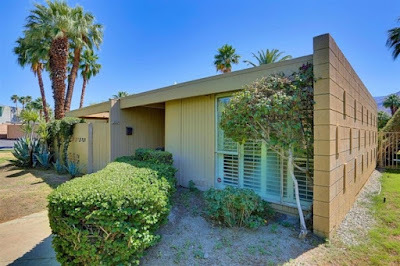 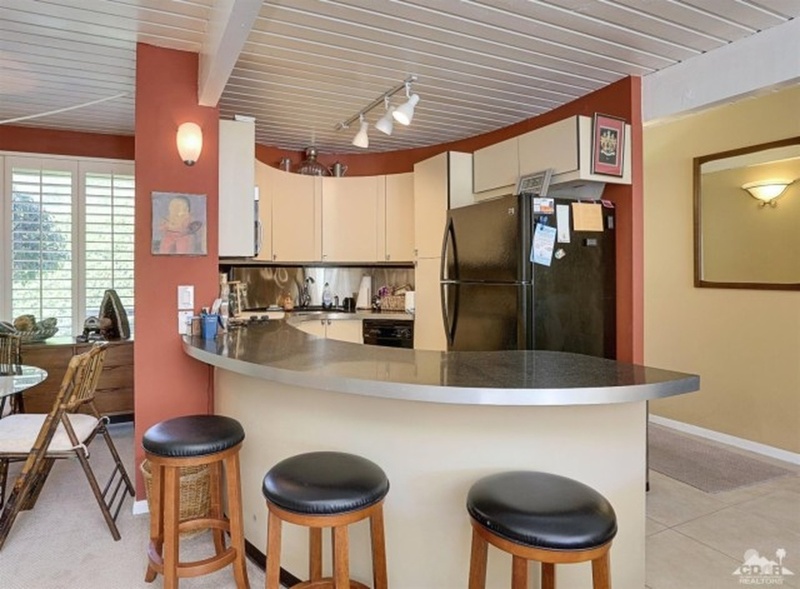 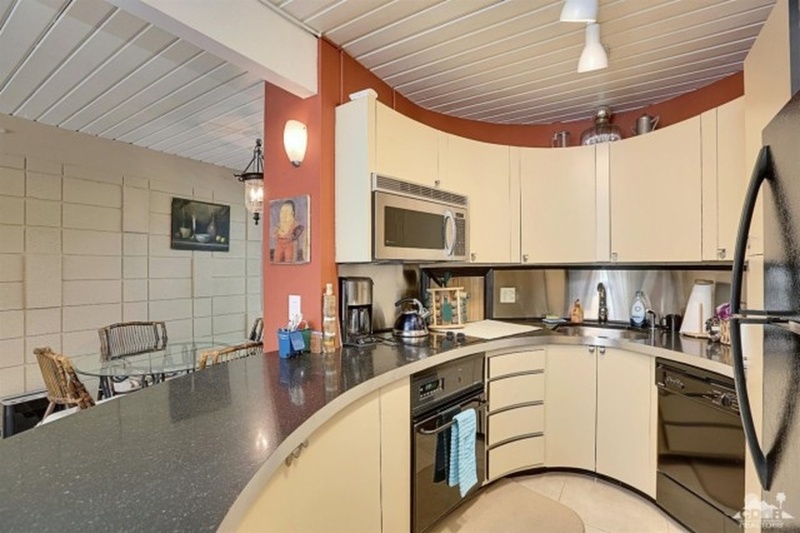 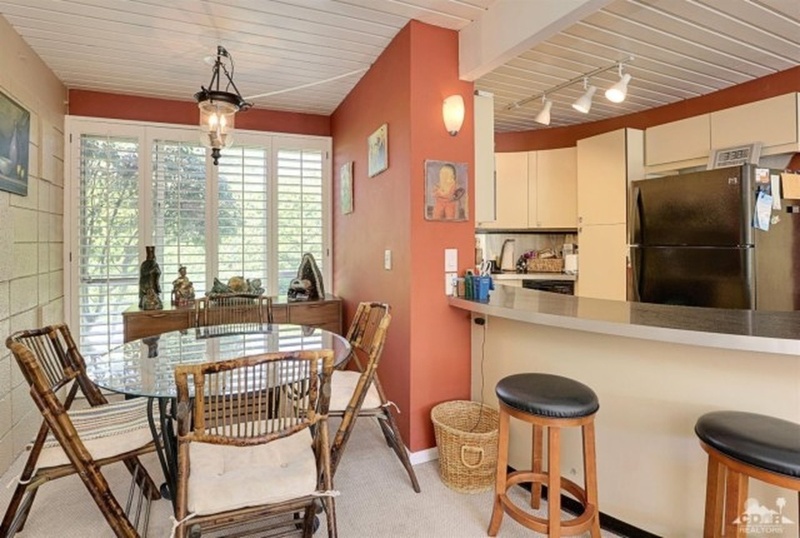 Measuring in at 1,068 square feet, this condominium features two bedrooms and two bathrooms, includes furniture and carries an asking price of $299,000 with monthly homeowners association dues of $370. 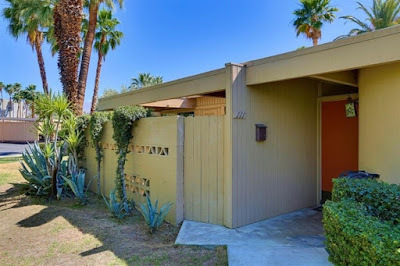 Situated near the northeast corner of Sandpiper, the exterior of this home features striking patterned shadow block and a private walled-in patio adjacent to the front entrance. Quiet plantings of vines and shrubs surround the walkway to the burnt orange front door, which leads into a small foyer and the rear-facing living room beyond. The living room overlooks the Sandpiper common area through large floor-to-ceiling sliding glass doors and clerestories. 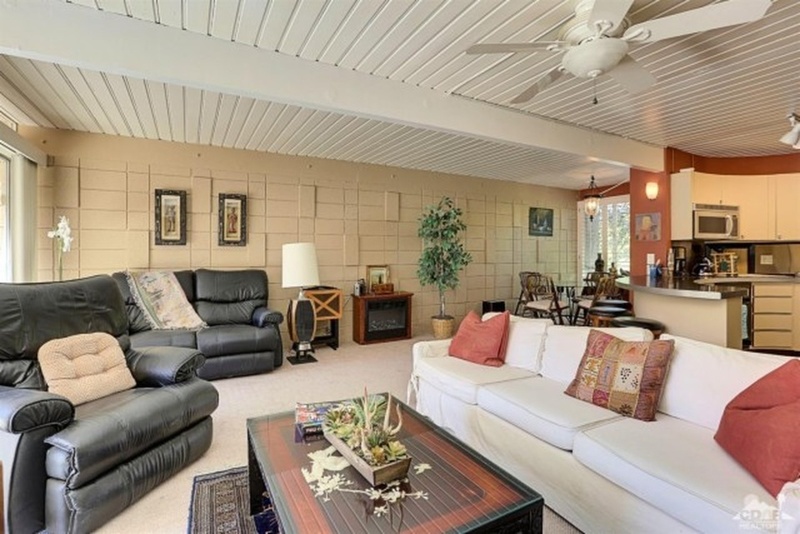 The patterned shadow block wall on the exterior of the unit repeats on the interior of the living room, and the original open beamed wood ceilings are still in place. The kitchen is still relatively in its original condition, with original cabinetry and unique oval shape that made these two-bedroom Sandpiper units so special and full of character. 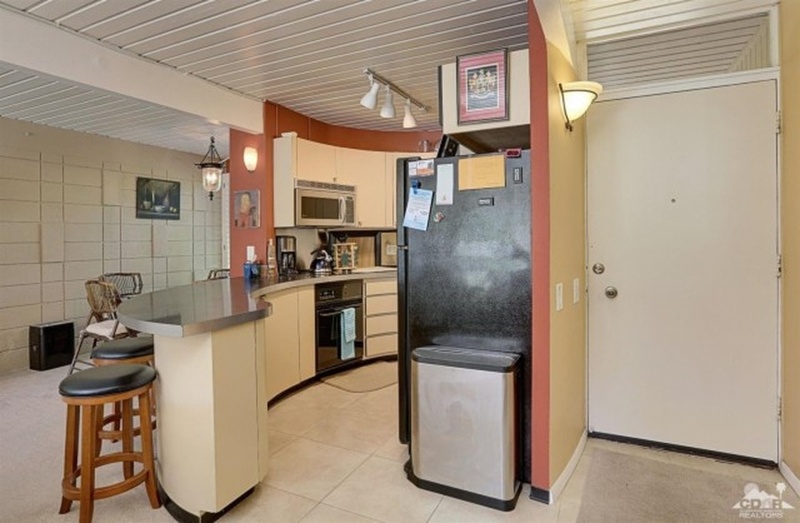 The counters and appliances have been updated, but nicely compliment the scale and style of the room. 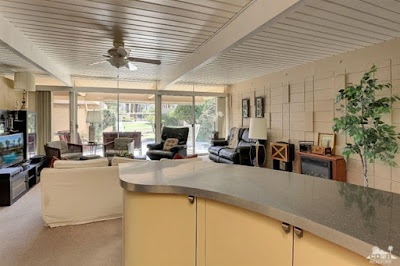 The dining area sits adjacent to the kitchen at the front of the unit, and is partially open as originally designed to the kitchen area. 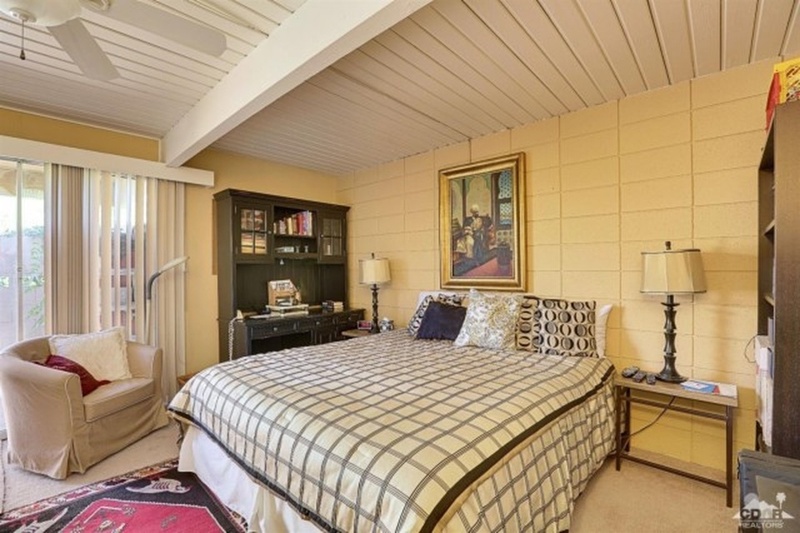 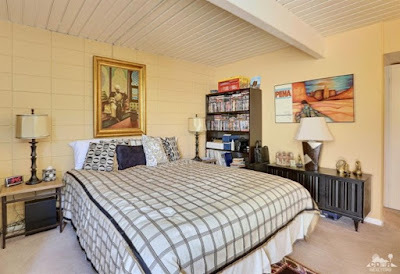 The master bedroom sits at the front of the home and features its own private patio. A block wall lines a portion of the room, and like the rest of the home the room features the original open beamed wooden ceilings. The secondary bedroom lies at the rear of the unit, overlooking the common area patio. 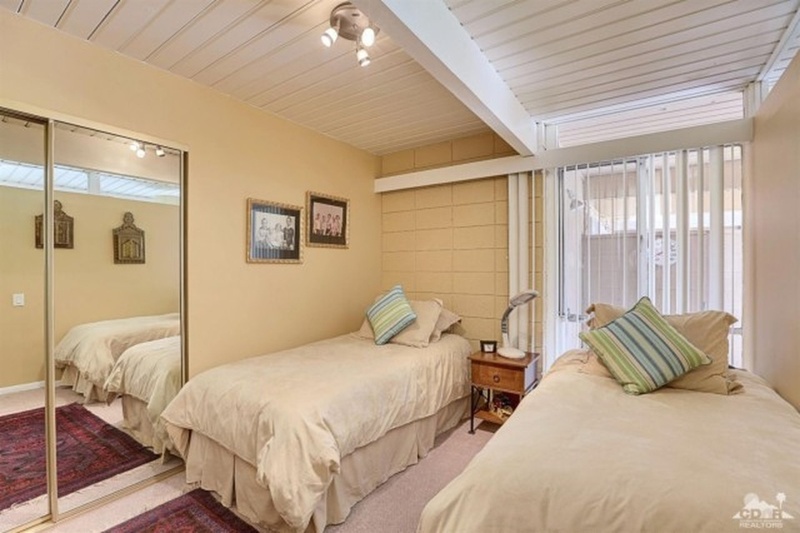 Diminutive in size, the secondary bedroom features high clerestory windows shared with the living room, allowing for light to flow between the spaces. 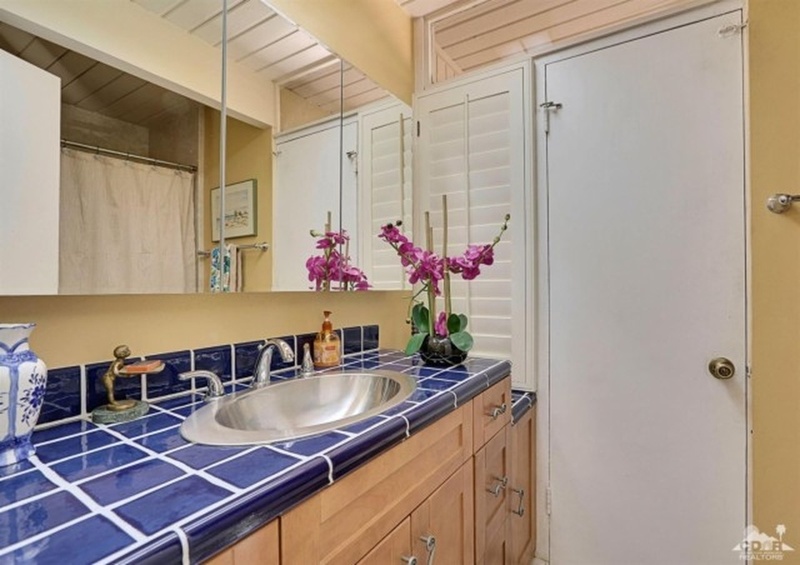 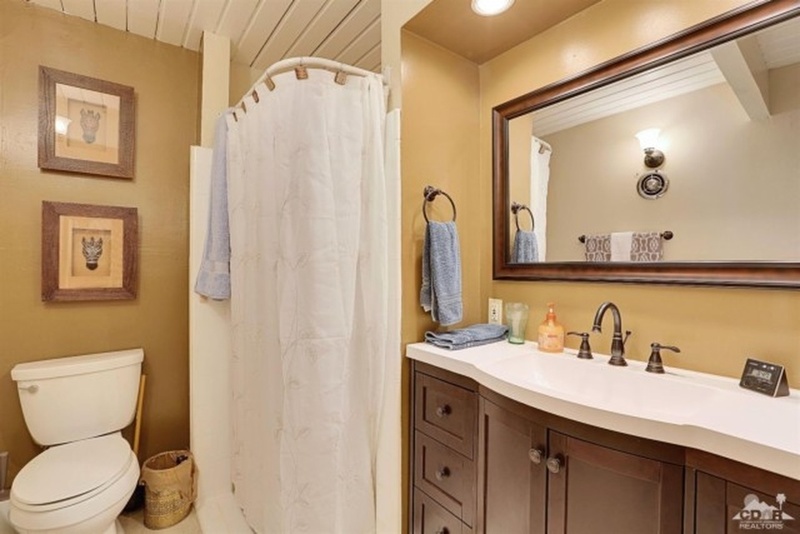 Both bathrooms have been updated over the years with average, newer fixtures, and neither reflects the original style of the home. 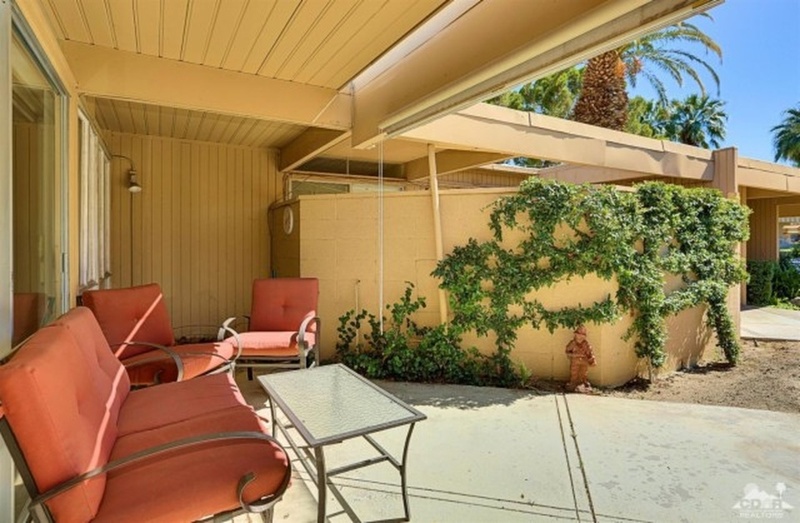 The rear patio features a large signature Krisel sunflap providing shade and sun protection, while the patio itself extends into the grassy Sandpiper common area. 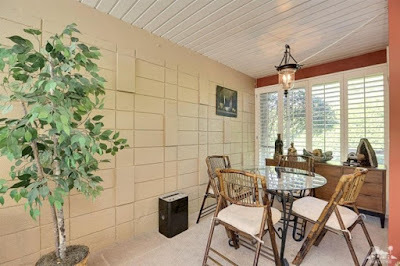 A neighboring vine-covered wall adds privacy to the open patio space. 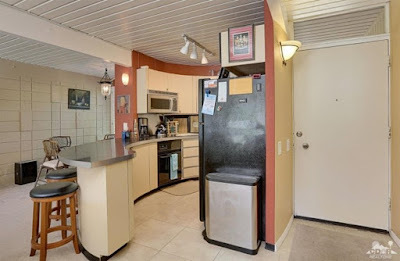 The unit shows a little full due to the large-scaled furniture, but overall makes a convenient move-in ready second home that can be renovated over time.